Directed by Brad Peyton, the film follows The Rock and his ex-wife Carla Gugino in the aftermath of an earthquake that rips apart California. He’s a helicopter pilot, and they decide to travel from Los Angeles to San Francisco to save their daughter, played by Alexandra Daddario. Trust me, you remember her from True Detective. It reportedly cost about $100 million to make, and judging by these graphics, it looks like the money was well spent. As with most disaster pictures, San Andreas targets – and topples – California (to the haunting tones of the famous "California Dreamin" by The Mamas and the Papas). The Rock grimaces and shouts as a savior diving into action when the big one hits. We see the Hollywood sign fall. We see ripples scream through downtown Los Angeles. We get a hint of the threat to San Francisco. And then the mother of all warnings arrives. Paul Giamatti, playing some kind of seismic expert, warns the East Coast that even though this is happening to the Golden State, they aren’t safe, either. 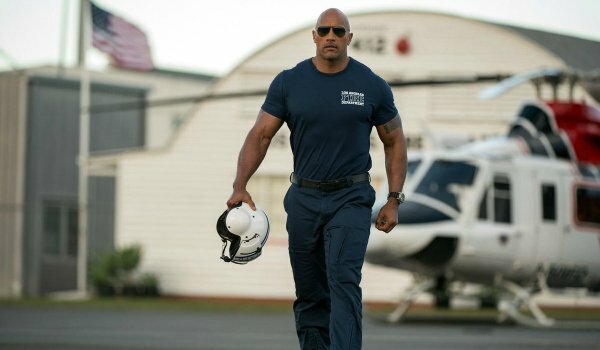 While San Andreas sounds like it should be on the resume of Roland Emmerich – and probably could have been, say, 10 years ago – this one instead is coming to us from The Rock’s Journey 2 director. Which gives me pause. Brad Peyton previously directed Cats & Dogs. Can he handle a massive-budget, effects-driven disaster picture like San Andreas? Even Emmerich, a reported master at this genre, turned in the likes of 2012 and 10,000 BC every once in a while. It’s a tough genre to deliver in, regularly. But Peyton has the one thing Emmerich never had, and that’s The Rock. If there’s one dude with the charisma, physicality and comedic chops to stare down the crumbling Hoover Dam in what is being described as a "Spielbergian" disaster epic, it’s Dwayne Johnson. We’ll see just how effective The Rock is when San Andreas opens in theaters next summer, on the prime weekend of May 29, 2015.